If you live in Friendswood, South Houston, or Pearland, you can achieve straighter and brighter smiles with our advanced cosmetic dental services. We offer a full range of treatments and services that will help bolster your smile’s health and appearance. Cosmetic dental procedures also ensure a healthier and stronger smile. Straight and even teeth will naturally protect you against decay and disease because they don’t retain bacteria the same way crooked teeth do. Enjoy a fully functional smile with our cosmetic services! Dr. Montz offers teeth whitening systems that can completely transform your smile in just one hour at our office. This powerful teeth whitening formula can give you a smile that is up to eight shades brighter with minimal sensitivity or discomfort. Chips, cracks, staining, and discoloration can ruin a healthy smile. Dental veneers are ultra-thin, porcelain shells that can conceal dental flaws. Prepless veneers are an alternative to porcelain veneers. 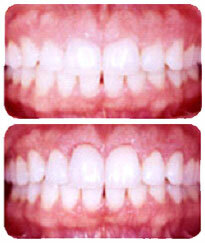 Prepless veneers are noninvasive and reversible. CEREC crowns make it possible for Dr. Montz and his team to design, manufacture, and place your natural-looking crown in a single cosmetic dentistry visit. With CEREC, you can get a fully functional smile in virtually no time! Near Pearland or League City? Schedule a Cosmetic Dentistry Appointment in Friendswood! At our Friendswood dental office, we strive to help you reach your aesthetic dental goals. We’ll work with you to give you a smile that beautifully complements your appearance. With cosmetic dentistry, you can feel enhanced confidence, increased self-esteem, and new charisma. Finally, you can have your dream smile! If you live in the Friendswood, Pearland, or League City areas, call our office to schedule your cosmetic dentistry consultation today!